USPS is expanding its grocery delivery service in the Los Angeles and San Diego areas, part of the organization’s efforts to explore new ways to meet customers’ changing needs. The test aims to build on the success of a two-month operational test that concluded last fall in San Francisco. Customers could order groceries and other products through Amazon Fresh and have them delivered by the Postal Service early the following morning. In Los Angeles and San Diego, USPS is delivering Amazon Fresh orders throughout the day. The new test began in early March. 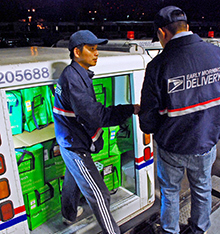 To make the deliveries, the Postal Service is using dynamic routing, a technique that sequences a changing series of delivery points in a logical and efficient order. USPS is testing several other products and services, including a Sunday package delivery program that began in 2013.
via USPS News Link Story – Fresh test.